ABU DHABI – Opening an historic visit to the heart of the Muslim word, Pope Francis on Monday pulled no punches in the United Arab Emirates, calling for true religious freedom while condemning the use of the name of God to justify violence. “I would like to emphasize religious freedom,” he said. “Without freedom, we are no longer children [of God] but slaves.” One cannot proclaim fraternity, Pope Francis said, and then act in the opposite way. The pope also denounced the building of walls as well as what he called the militarization of the human heart. His remarks came during an interreligious meeting at Abu Dhabi’s Founder’s Memorial in his first public remarks in the United Arab Emirates. Also joining him were the crown prince and de facto leader of the UAE, Mohamed bin Zayed al Nahyan, and professor Ahmed al-Tayyeb, the Grand Imam of Al-Azhar University in Cairo and a key Islamic theologian. The memorial is an installation dedicated to the founding father of the country, the late president Sheikh Zayed bin Sultan Al Nahyan. “We are here to desire peace, to promote peace, to be instruments of peace,” Pope Francis said, speaking in a nation which, until December, was part of a coalition bombing neighboring Yemen. An estimated nine percent of UAE’s total population is Catholic, representing some 900,000 people. Most, if not all of them, are immigrants, including roughly 60 priests who serve in nine churches. He urged the 700 religious leaders on hand, including Christians, Muslims, Jews, Hindus and Sikhs to enter the “ark of fraternity” in the name of God in order to safeguard peace as one family, much like, according to the Old Testament, Noah put two of each animal species in an ark to save creation from the flood. To honor the creator, Pope Francis argued, it’s necessary to cherish the sacredness of every person. Recognizing that every human being has the same rights, he said, is to glorify God. “What we are called to do as believers is to commit ourselves to the equal dignity of all, in the name of the Merciful One who created us and in whose name the reconciliation of conflicts and fraternity in diversity must be sought,” he said. Being part of one human family does not mean giving up one’s individual identity, but instead demanding the “courage of otherness,” involving the full recognition of the other person. Pope Francis also said the human family must hang together. Religions, he said, must help the human family fostering reconciliation, a vision of hope and offering concrete paths for peace, which can only come through education and justice. Finally, Pope Francis issued a call for protecting minors, which, he said, must be a universal effort. Coming back from Panama a week ago, Pope Francis said that an upcoming February 21-24 summit of presidents of bishops’ conferences and other Church leaders would address, but not put an end to, the crisis of sexual abuse of children. The problem of abuse, he said, “will continue. It’s a human problem. But a human problem everywhere,” a human drama the world needs to become conscious of. On Monday, he noted that last year Abu Dhabi held the first Forum of the Interreligious Alliance for Safer Communities, on the theme of child dignity in the digital world. The event recalled one held in Rome earlier in 2018 with the pope’s support and dedicated to the protection of minors from all forms of abuse, including sexual. 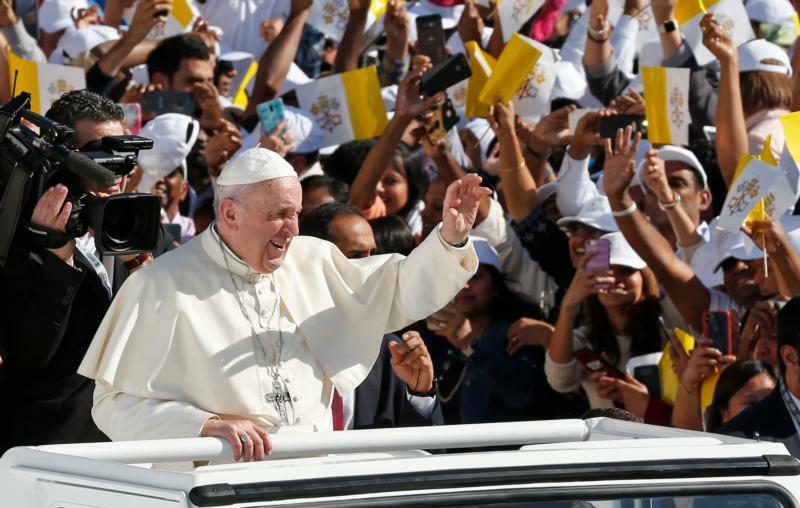 “I am thinking in particularly of Yemen, Syria, Iraq and Libya,” the pontiff said. All four countries have been marred by violence: Islamic extremist groups such as ISIS decimated Syria and Iraq, while they were also being crippled by foreign actors, including Russia and the United States; and then there’s the case of Yemen, bombed by Saudi Arabia and the UAE to the point that the country today is considered by the United Nations as the world’s worst man-made disaster. Religions, he said, cannot postpone their aid to the flourishing of the seeds of peace that are a fraternal living together founded on education and justice and human development rooted on inclusion and human rights. During the event, the prince announced that together with the Pope and the Imam he would sign a “Human Fraternity Document,” describing it as a historic document on dialogue among the followers of different faiths. He also announced a new “Human Fraternity” award for people who work “tirelessly and ceaselessly to bring people together,” with the first such prize going to Pope Francis and al-Tayyeb. The imam said Islam’s recent experience brings home the importance of striving for peace, including peace among the followers of different faiths.